Shh. What’s that rumbling sound? That’s the sound of stomping feet, from all the Sonic fans dashing to download the latest update in Sonic Forces: Speed Battle! Why? 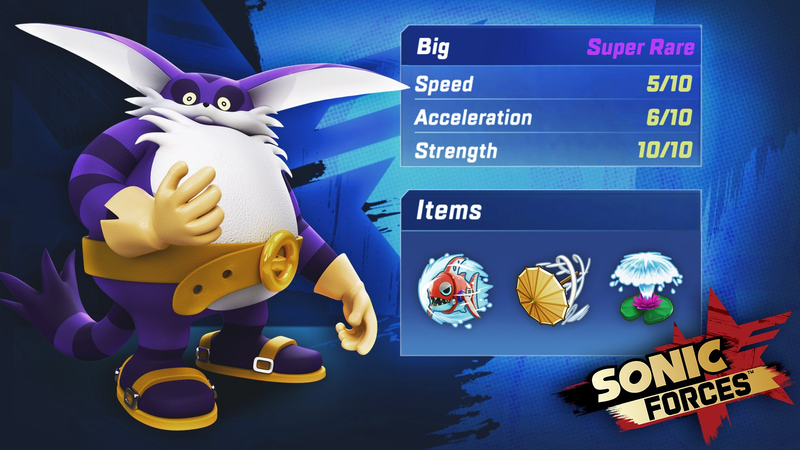 Because everybody’s favourite lazy purple fisherman, Big the Cat, is now available as a playable character in the mobile racer. With the Froggy-finding feline comes a bunch of new items that you can obtain and use against your opponents: the Lilytrap, Chopper Chomp and Umbrella Boost. All of these sound very much like the kind of things Big would use, so be sure to take advantage of them! This latest update also adds a new track, Tangled Tunnels, which is available to players as a Tier 5 stage. Get downloading the latest update on iOS or Android now to get some Big action on your mobile. So much for “We’re retiring Big the Cat”. This is why you should never underestimate a fanbase, and its ironic love. It’s a only spin -off. I think they said that he will make appearances in spinoff titles probably not main games though . Well, gives me an excuse to never play this game again. This pretty much means all the characters that were playable in Sonic Heroes are now available. I wonder who’s next. Perhaps another member of the Deadly Six? Or maybe Sticks the Badger? Am I the only one who considers Big an underrated character? The only game he really sucked in was Adventure, and I think he was awesome in most of the others (Hilarious in Chronicles, kind of awesome in the Archie comics). His hate makes zero sense. But I like him . My love for Big the Cat is thoroughly unironic.